NOTE: There is no warranty on exhaust pipes and mufflers with regard to any discoloration. Discoloration (blueing) is the result of tuning characteristics, cam timing, carburetor jetting, overheating, etc. and is not caused by defective manufacturing. See lubrication products for products that will help prevent or remove blueing. Great sound and easy to install, just don’t forget to get your new gaskets. Even though it didn't show my bike in fitment, it fit perfectly on my 89 FXST. The look is awesome. The sound is a nice deep tone. 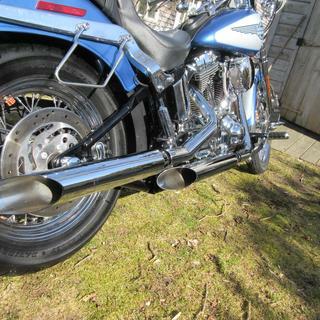 So I was on ebay looking for mufflers for my newly acquired Springer Softail, and I came across these. And, man, am I glad I did! S&S has always been synonymous with quality, so I knew there would be no issues with fit and finish, etc... And what a bargain! Could not pass them up. I've also dealt with Dennis Kirk before, so no worries there. So they look great, sound great, loud but not too loud, in my opinion. deep. throaty, none of that obnoxiousness of open pipes, but it looks like the baffles could be removed if you desire. (I might have to try it someday) If you're looking for slip on mufflers, don't hesitate. Get 'em while you can! Never got a chance to put them on the bike. Both pipes were delivered to me damaged. Can’t say much for DK’s quality control dept. However, the customer service dept. handled the return with stellar performance. Can I plug the cross over holes and not affect ANYTHING? What is used to plug the crossover openings ? BEST ANSWER: I didnt have crossover openings. They bolted right up. The picture may be wrong? These are slip ons. They install after the crossover. I am very happy with the sound over my longshots. A little more baffled but still loud enough to know you're there. They connect to the openings. Save the bushings from the OEM mufflers. You'll have to reuse them. Does these come with a gasket kit/equalizer gaskets? My screaming eagles have some road rash... considering these they look longer then the eagle 2s I have now but do they have highway rub like the eagle 2s? What do you mean by highway rub? do these slip on come with gaskets, or can I use the original ones that came with the bike new? if needed do you carry the gaskets? What is the I.D. of the inlet? Thinking about replacing my "older" screamin eagle 2 mufflers with these. are they comparable as to the loudness? Don't want something to quiet! 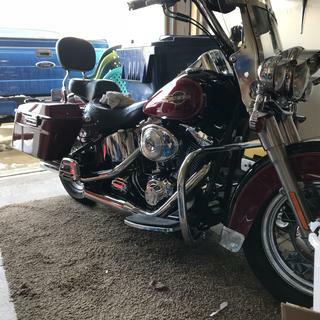 I have an 09 Vulcan Custom 900 and this pulls up for it when I go into exhaust now will that fit? Do the mufflers include a crossover?